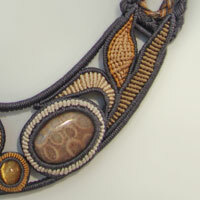 jewels in fiber, a collection of neckpieces, amulets, brooches and earrings is best described as a blend of fiber techniques and jewelry technology. Although trained as a silversmith, Marion's love of fiber led her to the making of jewelry with thread and gemstones. Marion combines Cavandoli knotting, double half hitching, micro macrame, kumihimo, braiding, crochet, and cordmaking of silk and nylon threads. Her Cavandoli pieces have as many as 500 knots per square inch. Brass & copper wire armatures often serve as structural support for the thread. 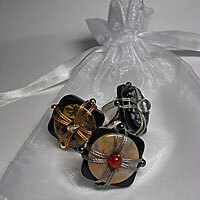 Semi-precious gemstone cabochons, fossils & crystals are set in the pieces. 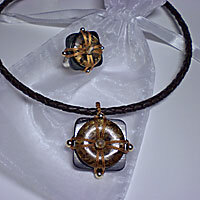 Handmade fabricated sterling silver clasps are integrated to many of her one of a kind pieces. Many pieces in her collection are designed using semiprecious gemstones shaped as donuts, rectangles or squares and beads with the knotting of fine silk thread and durable nylon thread, cordmaking and kumihimo braiding. 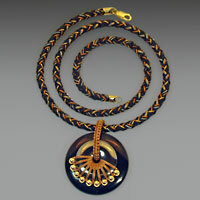 While some of her pieces are one of a kind, labor of love involving many hours of design and execution. Others may have just five to ten knots, a zen statement, distilled to its essence like a haiku, yet still containing her signature. Marion is personally involved in the various aspects of her work. She designs and execute all her pieces, including some of the dying of the silk threads. She selects and purchases personally all the elements included in her work such as beads and semiprecious gemstones donuts or shapes. Some of the gemstone shapes used in her work are designed by her and cut to her specifications. Each piece is handmade by Marion with individual care and attention!